The United Nations Volunteers (UNV) programme has been working to increase the integration and inclusion of persons with physical and intellectual disabilities in all aspects of political, social, economic and cultural life. Volunteerism is a long-standing tradition in social activism for the rights of persons with disabilities. Community initiatives often owe their origin to the voluntary effort of charities, religious groups or affected parents. Since late 2016, UNV has been strengthening efforts to facilitate the intentional deployment of UN Volunteers with disabilities, and collaborate with UN and other partners on delivering results for persons with disabilities. Engaging persons with disabilities as UN Volunteers enables them to contribute their skills and talents to enhance recognition of their capacities; support the UN entity and government partners of UNV in integrating persons with disabilities in their development, peace and humanitarian programming; and gain valuable skills and unique opportunities for personal and professional growth. Being a UN Volunteer has given me the opportunity to make a lasting difference in my own community. This has also helped the families of the blind, and raised community awareness of the issues and the rights of people like myself. —National UN Volunteer Nureddin Amro (State of Palestine) coordinated a project for the integrated education of disadvantaged blind and visually impaired people in 2009. UNV has a track record in the deployment of UN Volunteers with self-declared disabilities. In 2017, Rupmani Chhetri (India) was deployed and is serving as a UN Volunteer Advocacy Specialist on Disability in the Resident Coordinator’s Office, United Nations Development Programme, Ukraine. Her main tasks include raising awareness of the rights of persons with disabilities and related issues by working together with the UN, government and civil society. Rupmani has been identifying programmatic entry points to mainstream disability in UN programming, as well as developing institutional learning and capacity development initiatives for UNV to better engage volunteers with disabilities. 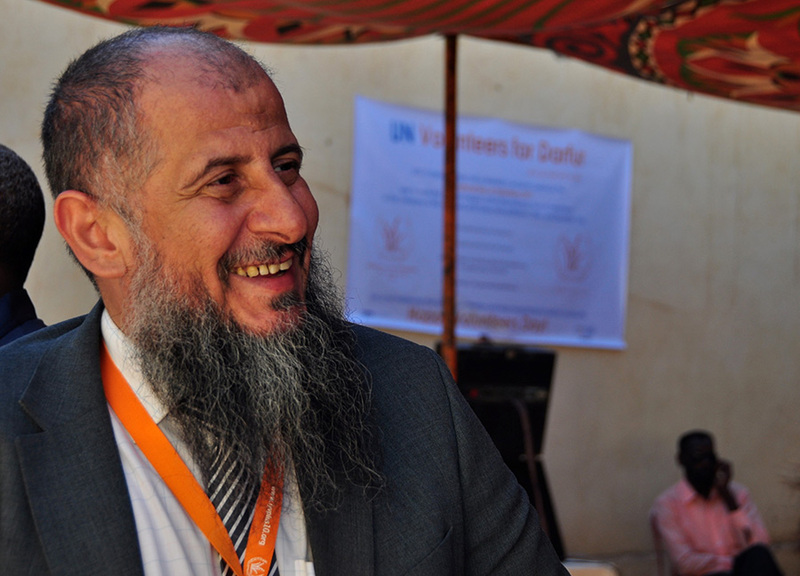 In 2012, UN Volunteer Mohammad Sarhan (State of Palestine) served as a UN Volunteer with the Communications and Technology Section of the United Nations African Union Mission in Darfur, Sudan. Having served with the United Nations Relief and Works Agency for Palestine Refugees in the Near East, Mohamed had helped develop the agency’s Disability policy. In Darfur, he supported the Darfuri Disabled Club by raising awareness and funds for their workshops and services, which included making prosthetic limbs, adapting wheelchairs and making handicrafts. UNV also pursues partnerships and volunteer engagement in support of people with disabilities. In 2016, national UN Volunteer Anil Kumar Mishra served a UN Volunteer District Youth Coordinator in Chhattisgarh, India, where his responsibilities included reaching out to out-of-school, marginalized youth in the district. He worked with marginalized communities to empower them socially and economically, reaching out to 40 youth with disabilities through youth clubs and providing information about government schemes and programmes and facilitated learning and skill development. In 2014, also in India, four national UN Youth Volunteer specialists provided rehabilitation and disability support services to children with special needs. Members of the local community had established the Malsawm Initiative in Churachandpur with financial support from UNDP, and UN Volunteers were providing specialized assistance to children with disabilities – as UN Volunteer School Administrator, Special Educator, Physiotherapist and Speech Therapist. The UNV Online Volunteering service also provides persons with disabilities with opportunities to overcome barriers to their inclusion and volunteer their strengths, abilities and skills from the comfort of their own home, thus making a tremendous impact on the lives of others as well as their own. In 2016, 156 persons with disabilities volunteered online through the UNV Online Volunteering service and collaborated with a range of organizations. “We have found keen, dedicated and accountable professionals who have submitted high quality work that was really needed and appreciated in our organization,” says Martine Levesque, Programme Director for Handicap International in Bolivia. UN Online Volunteers translated a range of documents that Handicap International uses in its programmes, trainings and advocacy campaigns. One such UN Online Volunteer, Selena Ramic (Serbia) has a B.A. in Political Science from the University of Minnesota and an M.A. in Human Rights and Humanitarian Action from Sciences Po in Paris. Selena contributed as an online volunteer researcher to the UN E-government Survey 2016 for the UN Division for Public Administration and Development Management, and as translator of materials that the UN Office for Disaster Risk Reduction used to train Croatian government officials.